Have you ever picked up a cookbook and opened it right to the page with the perfect recipe, the one that exactly suited your mood and for which you had all the ingredients? No? Well, neither have I. Normally I pour over multiple cookbooks, imagining this recipe and that–or this recipe combined with elements of that–but I never just pick the first recipe I come to. Until yesterday. I was all set for a long perusal of Neelam Batra’s The Indian Vegetarian, a book which miraculously had no torn bits of paper or sticky notes marking its pages. I settled into my comfy chair, sipped my coffee, and allowed the book to fall open, to page 266 as it happened: Kidney Beans in a Curry Sauce on the left, Black-Eyed Peas with Garlic and Scallions on the right. I was immediately drawn to the kidney bean dish because it sounded a lot like an Indian version of my home-state comfort food, Red Beans and Rice. I checked over the list of ingredients, and except for fresh ginger, I had all the ingredients. After a 15-minute trip to the nearby Indian grocery, where the ginger is the freshest in town, I had everything I needed for a complete Indian dinner, including a package of onion naan, brown basmati rice, and tender young okra to be roasted with curry powder. I took several liberties with the recipe, including leaving out the 1/2 cup of cilantro which Ms. Batra adds to the beans along with the ginger. (I’m one of those people who doesn’t like cilantro, though I have been training myself to tolerate it in small amounts as a garnish; feel free to use it if you like.) I also changed the cooking method of the beans, omitted the oil, and adjusted the seasonings a bit. My dish, while still mild, may be a little more highly spiced, but I think it’s true to the flavor and style of the original–simple home-cooking, the kind that’s universally comforting, nourishing, and delicious. 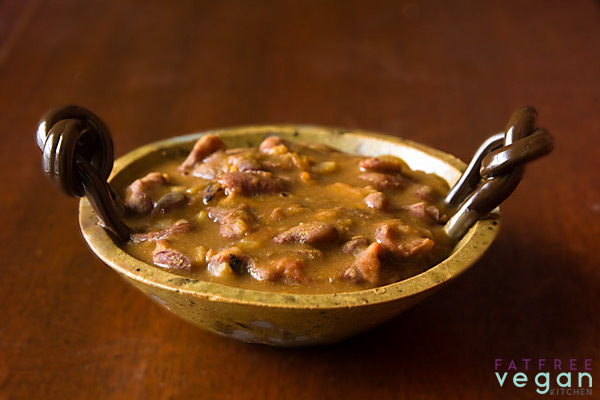 Rasedar Rajma is a homestyle kidney bean curry, with fresh ginger and garam masala. This vegan version can be sped up by using the pressure cooker or Instant Pot. Remove from heat and allow the beans to rest, covered, for at least 1 hour. Drain the water, add another 6 cups of water, and bring to a boil. Simmer until beans are tender, about an hour. (Alternately, pressure cook the beans: bring to high pressure and cook for 8-10 minutes. Remove from heat and allow pressure to come down naturally.) When the beans are done, leave them in their cooking liquid while you make the sauce. Heat a non-stick saucepan over medium-high heat until hot. Add the minced onion, and cook until it’s beginning to brown, stirring constantly. Add the garlic and ajwain and stir for 1 minute. Add the tomatoes and cook until their liquid has evaporated, about 5 minutes. Stir in the non-dairy yogurt and the coriander, fenugreek, turmeric, garam masala, and chilli pepper. Drain 2 cups of liquid from the beans and stir half of it into the sauce. Add the sauce to the beans and stir. If the sauce is too thick or dry, add some or all of the reserved bean cooking liquid. Simmer over low heat, stirring occasionally, for at least 20 minutes, until the sauce has thickened and flavors have blended. Check seasonings and add salt to taste. Transfer to a serving dish, garnish with cilantro if you like, and serve with basmati rice or chapatis, paranthas, or naan. I’m sure you could use canned beans instead of cooking them from dry. I would probably start with step 3 and add the ginger with the garlic and put 2 cups of water into the sauce. Then I’d add 3 or 4 cans of kidney beans that had been rinsed and drained. Simmer for about an hour, adding water as needed. I don’t think they’ll break down or get as soft as dried, but if you want, you can mash some of the beans to thicken the gravy. By the way, my husband insists that Black-Eyed Peas with Garlic and Scallions should be the next thing I cook from this book, and if I can get around the whole cup of cilantro it uses, I just might give it a try. That looks so good! And I love your bowls. Ooh, this sounds SO good! i would totally eat this up! Anonymous, I know that some recipes for naan are non-vegan, but the package I bought was completely animal product-free. Carrie, I just have one of those bowls, bought from the local farmers’ market and made by a local potter. Thanks, Melisser and Pleasantly Plump. It was really good! Great recipes… and if you don’t have your usual stash of “awain” seeds around, use cumin seeds! Susan, the bowl is absolutely gorgeous. Where did you get that one? Its adorable. This lounds so good, and uncomplicated- excellent. And wow, that bowl is georgeous. I wish I had a super-talented-local-pottery-type hanging out at our marché! This is too funny. I’ve been watching a guy on YouTube this last week, who cooks Indian food and it looks so yummy. But, I too despise cilantro (one of my fave sites is IHateCilantro.com) so have stayed away from Indian food not knowing until a few years ago when cilantro seemed to explode into all restaurant foods why I had avoided Indian food so much. We’d recently gone to a meeting, which doubled as a potluck and one of the dishes was Indian chili. It was so good I just emailed the cook and asked for the recipe which came yesterday and was titled Rajma. Been reading your site for months. Now I know why so many of your recipes appeal to me. I’m not big on breads either (nor soy, all of which makes me an odd veggie even to other veggies). Looks great! Since no one else asked: Can canned beans be substituted for the dried ones? I’ve thought about it, and I’m sure you could use canned beans instead of cooking them from dry. I would probably add the ginger with the garlic and put 2 cups of water into the sauce. The I’d add 3 or 4 cans of kidney beans that had been rinsed and drained. Simmer for about an hour, adding water as needed. I don’t think they’ll break down or get as soft as dried, but if you want, you can mash some of the beans to thicken the gravy. That’s my best guess, anyway! This looks absoutely yummy. Susan. I have to add it my “must make” list. And Mark, thanks for the suggestion about substituting cumin for the aswain–up here in the sticks we can’t always find these things! Thank you so much for the recipe! It was really delicious. I’m not a cilantro person, either — but I am definitely a hot and spicy person, so I’d probably up the cayenne a bit! This looks delicious — will have to check out this cookbook as I’ve been reading so much about it. hi there. this is totally off subject. but i figured yall would probably have an answer for me. by the way i just randomly found this blog by searching vegan blogs in google. okay. so i am just wondering if semi sweet chocolate chips are really considered vegan. because i know the ingredients show no animal products but i am still a little nervous about using them. are they truly vegan or do i have to buy a product that says ‘certified vegan’ on it? i am also a cilantro-hater…even the smell makes me quiver. but, this recipe looks amazing…mmmmmmm naan. and i agree with previous commenters, that is a beautiful bowl! perfect for the curry! Brit Rose, I can’t speak for all vegans. Some would balk at chocolate that contains sugar that might be processed through animal charcoal; they would stick with the chocolate marked vegan. Others are less concerned with the sugar issue (and possibly don’t even have access to “vegan” chocolate) and would be happy to use chips that don’t contain any actual animal ingredients. So, it’s really up to you to decide where to draw the line. I was surprised to read that you’re trying to adapt to small amounts of cilantro. I remember you said once there was a genetic component to the “soap” taste, so I figured there was no way to get beyond it. How’s it working? I love cilantro myself, and can’t imagine not liking it, but my oldest doesn’t like it at all. U know how u wrote about opening up a book and finding a recipe u wanted.. This is the second time this is happening to me on ur blog.. Earlier I had eggplant and was wondering how I would cook it.. Opened ur blog and boom there was a recipe for eggplant in a soup!! I had soaked some rajma beans today and was gonna make it.. And again I have a new recipe..
Kathy, after reading that people have successfully taught themselves to like cilantro, I decided to give it a try. After all, it gets old having to scrape off the top layer of my food (and give it to my husband) every time we eat at an Indian restaurant. So I’ve just been going ahead and eating the garnish, and I’ve also planted cilantro in my herb garden, and I take a nibble every now and then. It still tastes like soap, but not as strongly or as offensively as before. I still haven’t gotten to the point that it tastes good–or that I can tell why anyone would like it–but I’m started to get a sense of other flavors besides soap. Just barely–but maybe with more practice it’ll get better. I still think it’s a genetic characteristic, but maybe it’s one that can be overcome with hard work. The recipe looks great, though I will likely use all the cilantro called for in the original. Hi Susan! This looks great! My Mom recently taught me how to make this in the slow cooker. It comes out delish. Usually I soak the kidney/rajma beans in the morning before work, and then set the slow cooker when I am going to bed. It turns out great, and with hardly any effort. I usually have this with brown rice and a chopped onion relish. The papad from the Indian store (at least the brand I get) are vegan, and a nice crunchy complement)! I have a question about adding the salt when cooking the beans. Does this toughen them or prevent them from cooking thoroughly? Usually I cook my beans first and then add salt later. Also Puja, do you throw everything into the crock pot, or do you saute the onions and spices first? Thank you for your answers. I have 2 cups of kidney beans that I pulled out of the cupboard, and am putting my beans out to soak now. For years I cooked my beans without salt because of that “toughening” theory, but after reading that it’s just a myth, I started adding salt. If you look at my photos, you can see that my beans are so tender that they are barely holding together. I believe that cooking them with a little salt decreases the need to add much salt later on; the salt is in the beans and makes them much tastier. Of course, anyone who is avoiding salt should leave it out completely, but if you want your beans salted, I say go ahead and cook them with salt. Thanks for the recipe! I liked it, but I found that 2 tablespoons ground coriander seemed like an extremely huge amount compared to the measurements of the other spices. I only used 1 tablespoon and the dish still seemed overwhelmed by coriander flavor. After it sat overnight, though, it tasted pretty good. Thanks again-will continue to check your blog for more great recipes. Hi Susan..I love that bowl too! Quite besides the topic on hand..may I know what kind of oil spray (pump?) you use? I’ve been looking it up online & am kinda frowning at the $10 cost. Is there anyway one could use a cheap, plastic spray? Seetha, I have terrible luck with oil misters. I have the Misto and really don’t like it. It sprays out a stream, not a mist, no matter how often I clean it. I have a new one that I really like, only I don’t know the brand. It is a clear plastic and is about 6 inches tall. If I can find it online, I’ll post a link here. I’ve tried using kitchen spray bottles, but they didn’t work with oil. Nice recipe, Susan. Re: cooking beans, like kidney and garbanzo, I always soak the dry beans overnight in water and that cuts down on cooking time and there’s no need to pre-cook it/cook it twice. I also use a pressure cooker and it’s so convenient. It scares me to think that Susan might just be turning me into an Indian chef, between this and the Cauliflower Dahl! It’s a private joke among my friends that if I like you, I’ll invite you for dinner – and if I don’t like you, I’ll invite you sometime when I’m making Indian food! But this (and the Dahl) is simply superior!! Note – I used canned tomatoes and left out the added salt. Also, did not have fenugreek on hand, but it’s still really good. I look forward to making a second batch before the week is out. I just made this dish– wonderful but too much coriander. I will use probably 1 t next time. Any suggestions, Susan? Also, I used thyme since I did not have the Ajwain seeds. I think thyme was a good substitution for the ajwain. I made it with 2 tbsp. of coriander, but if that was too much for you, by all means, cut it down. What is ajwain and can it be substituted/ or omitted? as it says in the link to wiki ajwain can be substituted with thyme. Is the soy yoghurt vital to this dish or could it either be omitted or substituted with something else (coconut cream for instance)? I haven’t tried it with coconut cream, but my guess is that it would be a good substitute for the yogurt, which provides a little extra creaminess. You might also add a little lemon juice (1 tsp.) to replace the yogurt’s tartness. I really like this recipe. I just wish I had a pressure cooker so that I could cook it faster! Absoloutly wonderful dish. Thank you for posing such consistantly great food. I have never tried a recipe from your blog that hasn’t been delicious, and your recipes are always clear and easy to follow. Please keep doing what you’re doing! I have been looking for a naan recipe which does not use milk or yogurt. Though not completely vegan, I am lactose intolerant and somewhat allergic to soy. I found a recipe which requires only water plus 3 Tablespoons milk. Would rice milk work okay for this or oat milk? Do you have any good recipes for vegan naan? I don’t have a naan recipe, but I think that rice or oat milk would work instead of the milk, especially such a small amount. Good luck! I too,used used to have an aversion to cilantro. I thought it tasted like soap. Somehow, I now really like it! Perhaps it is from eating at Chipotle. I love their cilantro rice and fresh and corn salsas. This recipe looks delicious. Do you think almond milk would work instead of soy? I can’t have soy. Yes, it won’t be as thick but it should work. 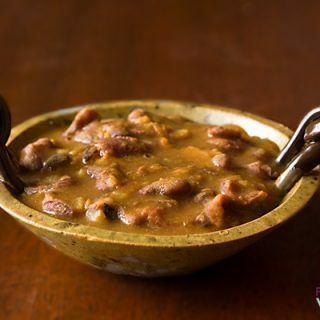 Rasedar Rajma! this is yumm, i want it right now. i wish i could have it right. Can anyone tell me if this recipe calls for fenugreek seeds or leaves? The recipe just says “ground fenugreek.” My guess is that the “ground” refers to ground seeds, but I’m not sure. I don’t have a lot of experience with either, and apparently they are rather different from each other.